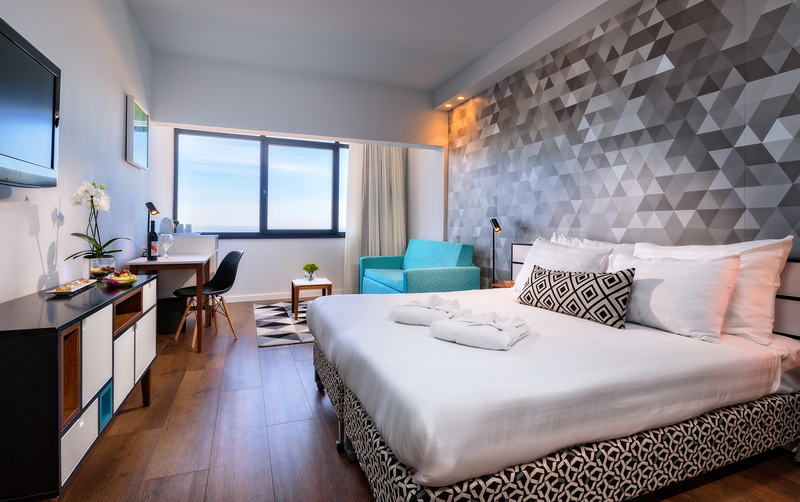 One of 14 hotels in the Prima Hotels chain, the Prima Tel Aviv Hotel, located close to Frishman Beach, has completed a one-year renovation project. One of 14 hotels in the Prima Hotels chain, the Prima Tel Aviv Hotel, located close to Frishman Beach, has completed a one-year renovation project. All 63 of its rooms, a mix of Single (9m²), Superior (19m²) and Deluxe Sea View (25m²), have undergone a full redesign inspired by the White City and architecture of Tel Aviv and have introduced new furniture, beds, mattresses, bathrooms and doors. All rooms contain a desk and chair, tea and coffee making provisions, a mini fridge, multi channel TV, toiletries and a safety deposit box, with Deluxe Sea View rooms also offering a sofa bed, bathrobes, slippers, mineral water and a sweet snack. Other renovated areas include the entrance’s façade, the lobby and reception desk, lobby lounge and lobby bar, outdoor patio, and the hallways across guest room floors which have new carpeting and revamped decoration. In addition, the Prima Gallery for local art on the lobby floor, featuring in-house curated art from 23 artists presented across temporary exhibitions, has been refurbished. Other hotel amenities include two event halls and fully equipped meeting rooms, an evening happy hour for guests, with complimentary snacks and alcoholic beverages, free bicycle hire and free Wifi throughout the hotel.